If your TV/projector was built before 2005, it is not HDMI compatible. This means that you’ll never be able to fully use that expensive CRT projector, digital projector, plasma display, or PC screen with new sources like the PS3, Xbox360, Blu-ray players, Cable TV / Satellite boxes, or PC graphics cards. You need HDfury2 to unlock the full potential of your display! Why buy an expensive new display device when your existing one works perfectly well? Enhance your display’s compatibly and value with HDfury2! Designed by a group of home theater videophiles, the HDfury2 delivers a razor sharp picture with unprecedented colour from any HDMI source, supporting resolutions up to and beyond the FULL HD (1080p) standard. The picture quality improvement when using HDfury2 is immediately obvious, providing an amazingly clear and detailed picture! Software upgradeable (EDID and Firmware) to never become obsolete! A world first! HDfury2 accepts both digital RGB and component (YCbCr) video over HDMI and automatically processes both correctly for zero loss of dynamic range. HDfury2 takes this HDMI standard 16-235 data and cleverly scales it to a fully maximized output dynamic range (0-255) before sending it out to the final DAC conversion stage. The result is an absolutely stunning and dynamic picture! Technical details: RGB as defined by CEA861A/B/C/D specification defines the leading edge of HSyncs at different locations than the SMPTE/ITU standard does for component (YPbPr). This is why ALL but one direct RGB to component converters fail to correctly center the picture. Others disregard time-domain correction placing the image too far “left” on the screen. This is the reason why people using the original HDfury coupled with a typical stand alone converter fail even though the original HDfury is not doing anything “incorrectly”. It simply passes information which will be interpreted incorrectly by many TVs. As well, while less important (but still missing from other converters), HDfury2 outputs tri-level syncs in all HD modes as required by standards. Again, no standalone RGB-converter does this. We have never come across or heard from a customer of a TV that requires tri level sync but still it’s nice to meet the spec and be able to claim compliance. How does the HDfury2 compare to the original HDfury? Screen position adjustable via firmware? Output resolution limit and custom profiling? Some source devices have issues handshaking with DVI-D (hdcp) devices such as the original HDfury, requiring the use of an HDMI switch between the source and the original HDfury. SOLVED! HDfury2 uses an HDMI input instead of DVI-D (hdcp) granting compatibility with all HDMI sources including those that could not handshake properly with DVI-D (hdcp) devices. Some sources like the Denon 4308 receiver could not handshake with an incomplete CEA861 EDID extension block causing issues with the original HDfury. SOLVED! The HDFury2 CEA861 EDID extension block is compliant to latest Rev. D.
The picture is shifted to the left on some displays when using the original HDfury and it could not be centered within the display’s adjustment range. Use of external device such as RTC2200 or Box 1020 was needed. SOLVED! HDFury2 doesn’t shift the picture to the left. It is perfectly centered. Some sources do not output enough current on their digital output pin#14. Use of external power supply was needed for the original HDfury (either Wall Plug or USB). SOLVED! HDFury2 consumes 160mA less current while running at 1080p compare to the original HDfury. HDfury2 supports more sources out of the box without requiring the use of the power supply. Some users reported their original HDfury ran “hot” after many hours of use. SOLVED! HDFury2 unit runs 1.2w cooler at 1080p than the original HDfury. The original HDfury is unable to run long analog cables on its output. ex: Displays with VGA cords is problematic. SOLVED! 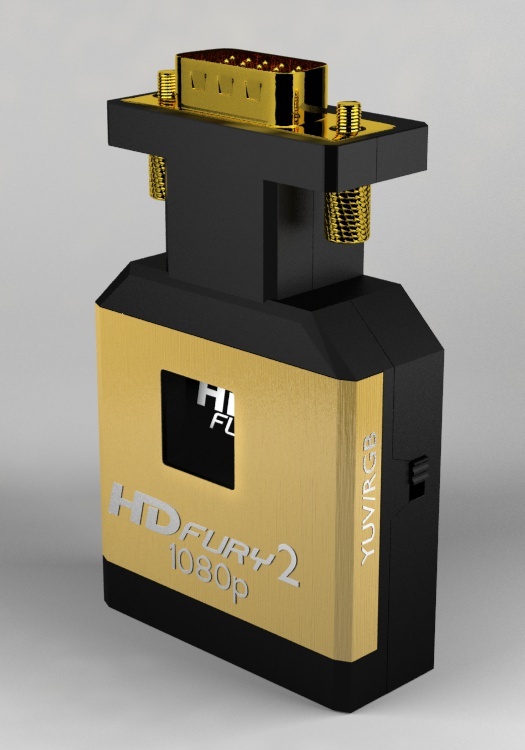 HDFury2 can run longer analog cables on its output (to approximately 25-35 feet). Hard to identify when the power supply is required for the original HDfury (some source devices do not provide enough current on pin14). SOLVED! HDFury2 has a new LED system which indicates power status: If the LED is OFF or blinking then the HDFury2 is not receiving enough power from the source device and the external HDFury2 power supply must be used. If the LED is ON the HDFury2 is receiving adequate power. Here is some further informations about HDfury2 way of acting with color space and BTB/WTW based on firmware version / source settings for INPUT HDMI Datastream and Switch position for OUTPUT configuration. - Dynamic processing is done, YUV[16-235] to Analog RGB fullscale [16->0mV and 235->704mV] (Dynamic scaling to complete range with colorspace conversion for V1.41 and V1.5 firmware). BTB and WTW informations clipped for these FW revisions. - [16->24mV and 255->712mV] (complete range with colorspace conversion for V1.51 firmware). BTB and WTW informations keeped. No dynamic processing at all. - [0->0mV and 255->772mV] (complete range with colorspace conversion for V1.51 firmware). BTB and WTW informations keeped. No dynamic processing at all. - Dynamic processing is done, YUV[16-235] to Analog YUV reduced scale [16->0mV and 235->648mV] (Dynamic scaling to reduced range without colorspace conversion for V1.41 and V1.5 firmware). BTB informations clipped for these FW revisions but WTW information ouputed (255->700mV). - (complete range without colorspace conversion for V1.51 firmware). BTB information outputed below blanking level (@ -24mV) and WTW informations keeped and outputed @ ~750mV above blanking level. Dynamic processing is done. Note : colorspace conversion is the digital treatment that is done by the HDMI receiver to convert RGB to YUV or YUV to RGB. This treatment is done in the digital domain with 10 bits accuracy. No HDMI? No problem! 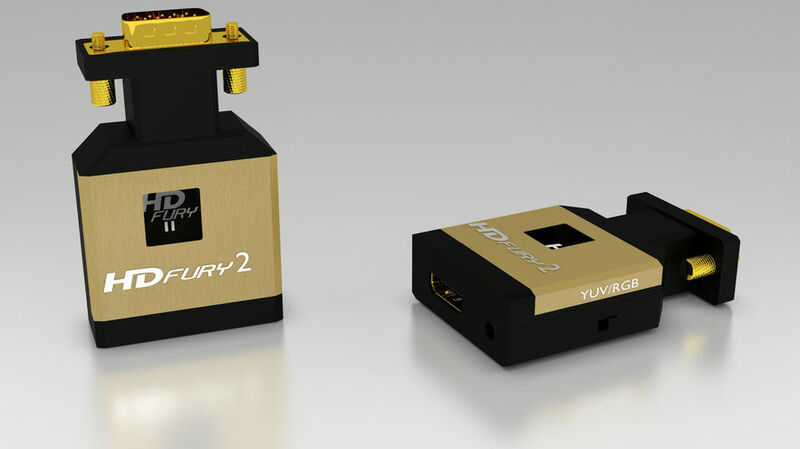 The HDfury2 upgrades any TV or projector by adding HDMI! Works with any display that accepts either Component (YPbPr/YCbCr) or RGB/VGA! Don’t be stuck watching Blu-ray, DVD, Satellite/Cable at only 480p! Add an HDfury2 and watch hi-def at up to FULL HD 1080p resolution! Why do I need HDfury2? Without an HDMI input your display will be limited to 480p in most cases – that’s only 1/6th the resolution of 1080p FULLHD! You need HDfury2 to unlock the full potential of your display! Why buy an expensive new HDTV when your existing one works perfectly well? Enhance your display’s compatibly and value with HDfury2! Designed by a group of home theater videophiles, the HDfury2 delivers a razor sharp picture with unprecedented colour from HDMI sources, supporting all resolutions up to 1080p FULL HD. The picture quality improvement when using HDfury2 is immediately obvious, providing an amazingly clear and detailed picture! Blu-ray, HD DVD, and DVD players (as well as the Xbox360 and PS3) will not upscale standard DVDs to 1080p over analog outputs. They are limited to 480p output only. The HDfury2 overcomes this limitation. If the Image Constraint Token (copy protection) is enabled on Blu-ray or HD DVD discs reduces resolution from 1080p to 540p (1/5th the resolution) over analog outputs. The HDfury2 overcomes this limitation. And most importantly: The image quality is significantly worse over analog outputs. The HDfury2 overcomes this limitation. 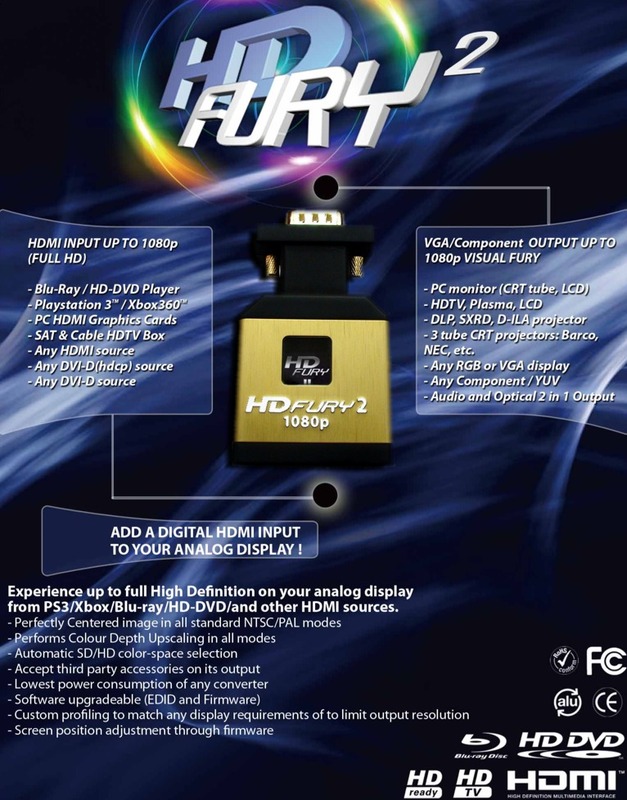 HDfury2 is what you need to to add digital HDMI 1.2 to your TV to bring it into the next generation and provide the best image quality possible! Will HDfury2 work for me? HDfury2 Component Cable: For displays with component (Y/Pb/Pr) inputs. Included with every order. 6′ USB power cable: Part of the HDfury2 power supply. (ADVANCED KIT ONLY) 6′ HDMI cable: For connecting your source device to the HDfury2. (ADVANCED KIT ONLY) 6′ Optical audio cable: A mini-Toslink to regular Toslink/SPDIF (fiber optic) cable for connecting the HDfury2 sound output to your receiver/pre-amp. If you can see the output it means that you will be able to display 720p from any HDMI or DVI(HDCP) source on your screen using the HDfury2 RGBHV output. If you can see the output it means that you will be able to display 1080p from any HDMI or DVI(HDCP) source on your screen using the HDfury2 RGBHV output. So once again, performing the above test will allow to find out if HDMI 720p or 1080p could be displayed on your screen with HDfury2 RGBHV output. Therefore it is best to use the above test to make sure that the HDfury2 RGBHV output will work with your display device ! 2) Is HDfury2 compatible with my Source ? HDfury2 is FULLY compatible with all recent HDMI (and/or DVI-D hdcp) source devices such as the PS3, X360 Elite, HD-DVD players, Blu-Ray players, HDMI graphics card and the latest set-top-boxes (STB) and DVD players with HDMI outputs. We recommend that a power supply be used for all sources. You should ALWAYS use the supplied breakout (extender) cable that shipped with your HDfury2: No warranty on the quality can be given when using another breakout cable, especially cables that are longer. Once you hooked up HDfury2 to your display and ran a HDMI cable to your source the first thing you need to check is the Blue led status: Is the Blue LED ON ? If LED is OFF, the HDfury2 is not working, and therefore no signal is going out to your display. For example, you can connect HDfury2 to your PC VGA screen, and you will see that the first time the picture is shifted to the left. Blu-Ray players, HDMI graphic cards, PS3, Xbox 360 Elite are all able to unleash their true potential (720p/1080p mode) only through the HDMI output. If you want a valid ticket to the Full HD world you either need a compatible display (with HDMI input) or an HDfury2 for your existing display. 1080p FULLHD as found on Blu-ray and HD has over 6 times the resolution as standard DVD and TV. For the best movie and and home theater experience, you *need* Blu-ray/HD. Does the HDfury2 change the resolution? Upconvert or downcovert? The HDfury2 does not change the resolution or refresh rate in any way. It converts the digital input signal to an analog RGBHV (VGA) or Component (YPbPr) signal and extracts the audio as well. It also provides HDCP decryption if needed. The HDfury2 outputs whatever resolution you feed it. What resolutions does the HDfury2 support? The HDfury2 supports any resolution/refresh rate combination (interlaced or progressive) up to 1080p/60Hz. The only limitation is that your display must support the resolution/refresh rate as well. I use component cables to connect my Blu-Ray or DVD player to my display device and it works just fine! Why do I need HDfury2? Blu-Ray and many DVD players can also upconvert standard definition DVDs to higher resolutions (720p, 1080i, 1080p), but they only do this via the HDMI outputs (not component). So if you want to get the higher resolution benefits of your player’s upconversion circuitry, you’re forced to use HDMI. As well, in the future it may not be possible to pass certain high definition content over component video cables. A content flag called the ICT (Image Constraint Token) allows broadcasters and movie studios to limit or “down-res” the HD video signal to standard definition 480P resolution over component video cables. This is not something that has been activated yet, but it could be used at some point in the future. And the most important reason to use HDfury2: The picture quality is substantially better! (Sharper/cleaner/less noise/less ringing/etc). Talk to someone who uses one or read the reviews! My Barco requires negative sync to work. Does the HDfury2 output negative sync? The HDfury2 does not alter the signal that it is fed in any way. If it is fed a negative sync signal, it will output a negative sync signal. If it is fed a positive sync signal, it will output a positive sync signal. You can use boxes from Extron or Altinex to invert the sync if required. To alter the sync to make it work with your projector, you can add an RTC2200 box to your HDfury2 setup. I have a scaler or doubler with DVI or HDMI inputs and an RGBHV output connected to my display device. I don’t need an HDfury2 right? Incorrect. You still need the HDfury2 if you want to use HDMI sources such as Blu-Ray or DVD players that may have HDCP-protected content. The scaler, by law, is not allowed to output content via RGB if the source content is HDCP protected. The scaler will simply TURN OFF its analog RGB output. Only the digital DVI/HDMI outputs will remain on. To solve this, connect the HDfury2 to the DVI or HDMI output of your scaler, and then connect the HDfury2 to your display device. Simple! I have a scaler or doubler with DVI or HDMI inputs and a DVI/HDMI output connected to my display device’s DVI or HDMI input. I don’t need an HDfury2 right? Maybe. You still need the HDfury2 if you want to use HDMI sources such as Blu-Ray or DVD players that may have HDCP-protected content *and* your display device does not have an HDMI input. The scaler, by law, must pass the HDCP-protected content all the way to your display device. The display device must decrypt the content. If your display device only has a DVI input, it will not decode HDCP. To solve this, connect the HDfury2 to the DVI or HDMI output of your scaler, and then connect the HDfury2 to your display device. Simple! I want to connect a longer cable to the output of the HDfury2. Can I do that? Yes. The HDfury2 supports analog output cables up to 25-35 feet in length. Does the HDfury2 support 1080p/24fps found in next generation Blu-Ray and HD DVD players? Yes! As long as you stay under the 1080p/60 bandwidth requirement, the HDfury2 doesn’t care what the resolution or refresh rate is. Note that most displays that do not have HDMI inputs do not work at 24 Hz however. Make sure to set your source devices to 50 or 60 Hz output and not 24 frames (Hz) or “Automatic”. Will the HDfury2 shift the image to the left or cropped (cut off) in any way like some other converters? No. Unlike some of the other converters, the HDfury2 includes advanced features to ensure that at all display resolutions, the image stays perfectly centered (in component mode) and not cropped in any way for any display device. In RGB mode the image is passed directly through so make sure your display has image shifting controls if RGB is to be used. My display only has component (YPbPr) inputs. Does the HDfury2 support component output? Yes! 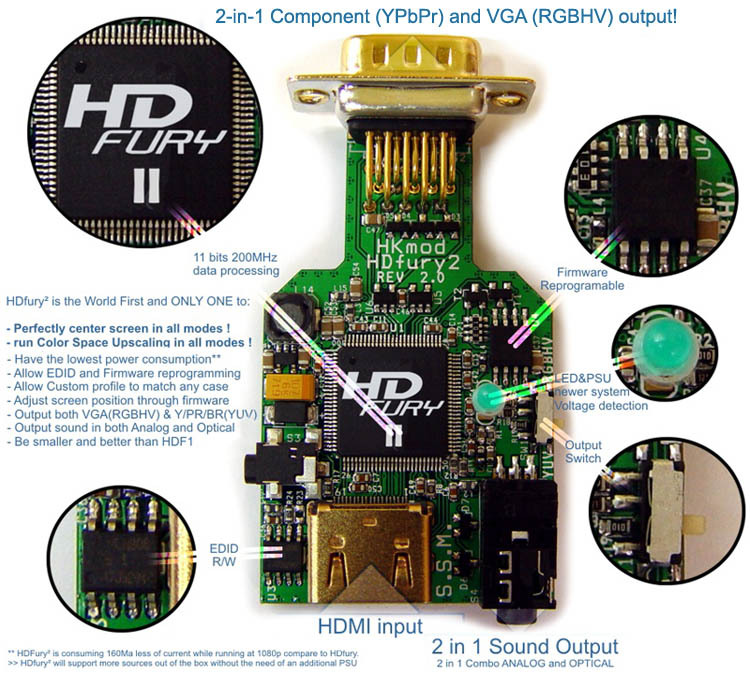 Unlike the original HDfury, HDfury2 has a user selectable Component (YPbPr) or VGA (RGBHV) output to ensure that it will work with any display device. YES! Not only is this very dangerous to you (the homeowner) you may damage your HDfury2 and/or your display. Your HDfury2 warranty is null and void if you bypass the grounding of your display device. Please do not do this! Bypassing ground pins because of ground loop problems, hum problems, or other reasons is very dangerous and only masks the problem. You need to fix the source of the problem. The ground pin is there for your safety and for the safety of your equipment..
(1) Your source device likely doesn’t provide enough power to the HDfury2. Make sure to use the included HDfury2 power supply and ensure that your display supports 1080p FULLHD if you want to use 1080p. (2) Many TVs do not support 1080p and must be fed a 1080i signal instead. Make sure to set your source to 1080i unless your display’s manual specifically states that it supports 1080p. (1) Make sure your display supports the resolution the source is feeding it. If your TV does not support 1080p, set your sources to 1080i. Some sources will automatically use the highest resolution available to them based on what they see connected, and since they see the HDfury2 which supports 1080p FULL HD, the source will ‘think’ you have a 1080p capable TV and is most likely feeding the HDfury2 a 1080p signal. You need to lower this to 1080i in the source device. (3) Make sure you’re using the HDfury2 power supply. I’m still getting a black screen from my PS3 when using the HDfury2. How can I fix this? The problem is that you likely connected the HDfury2 to the HDMI port while the PS3 was still setup to output by another port (component or composite). The result is no picture over HDMI. The PS3 will output low resolution on every output when you reset the display settings this way: PS3 in stand by mode, hold on power for 5 sec until you heard 3 beeps. You need to change a setting in your PS3: In addition to setting up the HDMI resolution on the PS3 as outlined above, you also have to go under the Blu-Ray playback settings and adjust the DVD upscale feature because by default it will also be 1080p. Another hint: When you first connect an HDfury device to the PS3 (such as the original HDfury, HDfury Gamer Edition, or the HDFury2) the PS3 will ask: “A new HDMI device has been detected, do you want to use it?” Answer ‘YES’ ONLY if your TV is 1080p capable. Otherwise answer ‘NO’, and you will be presented with another screen where you will be able to change the resolution settings and set them manually to whatever your TV supports. - If the HDfury2 blue LED is OFF during the picture blanking, the problem is with the HDfury2. HKmod will replace it for you. - If the HDfury2 blue LED is ON during the picture blanking, the problem is with the the component (YUV) cable, RGB cable or the display. You likely have a display that only accepts RGB and you have the switch on the side of the HDfury2 set to component output (YUV). Switch it to RGB. What sort of power supply does the HDfury2 use? When is it needed? Trying to use an AC/DC adaptor that doesn’t adhere to these three requirements may destroy the HDFury2. I couldn’t get the original HDfury1 to work with my Dell 2405FPW display because the Dell doesn’t like HD resolutions. Will the HDfury2 work? Yes. The HDfury2 supports the Dell 2405FPW display up to 1080i as long as you use the component input. My display is RGB only (no component input) and I don’t have any image adjustments to compensate for image shifting. What can I do? Do have an RGB only display and are experiencing image shifting and can’t compensate with your display adjustment? Your solution is to set the HDfury2 to component output and plug it into a Box1040 or leave the HDFury2 in RGB mode and use the Box1020. Both will provide image alignment along with other features such as a cable driver, gamma boost, and switching. My picture is blank when I play back Blu-ray discs but not when I play DVDs. What’s going on?? Blu-ray discs are natively 1080p/24Hz. You likely have your Blu-ray player set to 24Hz or “Automatic” frame rate output so that it is outputting a 24 Hz (fps) signal. Most displays that do not have HDMI inputs do not work at 24 Hz so you need to turn this off. Either set your Blu-ray player to 50 or 60Hz or set ‘Automatic Frame Rate’ to off. See your Blu-ray manual. “I am very impressed with the quality of this device. Despite the issues with the earlier revisions, this last version 3 is ‘rock solid’. I am using an older Mits RPTV (55809) with component video and the hdfury2 has given it a ‘brand new life’. I’m using a DirecTV receiver through a Harman-Kardon 347 via HDMI switching. Previously, I was using component video and the difference is noticeable. I can’t wait to being acquiring other components to plug in.” – Gregg L.
“I am blown away at the speed of your [tech support] response! I must say that yours has been not only the fastest, but the most relevant tech support reply I have ever received. Many thanks. I am also glad that “someone’s reading the content I’ve written” because I must admit that as I drafted my original email to you, I was fairy certain NO ONE was going to bother to actually READ it !! LOL” - Eric B.